SEATTLE--(BUSINESS WIRE)--(NASDAQ:AMZN)—Seven months ago, Amazon introduced Echo, a new category of device designed around your voice. Echo was available on an invitation basis to customers who wanted to help shape the device as it evolved. Today, Amazon is excited to announce that Echo is now available for all customers. Order now for $179.99 at www.amazon.com/echo. Echo will start shipping July 14. Connected home: With integration of Belkin WeMo and Philips Hue products, use Echo to switch on the lamp before getting out of bed, turn on the fan or heater while reading in your favorite chair, or dim the lights from the couch to watch a movie—all without lifting a finger. Pandora: Access Pandora’s library of over 1 million tracks simply by asking Alexa for a station by genre, artist, or song. Once music is playing, you can pause and skip tracks using voice commands, and tell Alexa to give a track a thumbs up or thumbs down to train the station to your taste. Audible: Listen to audiobooks from Audible with Echo. Simply say “Alexa, read my book.” Echo also supports Whispersync for Voice, which allows you to seamlessly switch between reading and listening without losing your spot. Start reading on Kindle, and pick up on Echo right where you left off. Google Calendar: Access your Google calendar events with Echo—just use your voice. Hear what’s on the calendar for the day or check if you’re free for dinner with friends. If This Then That (IFTTT): Create IFTTT recipes using Echo’s Shopping and To-do Lists to make your life simpler and more manageable. IFTTT is a service that connects your devices, apps, and websites with simple rules called “recipes.” With IFTTT recipes, you can use Echo to add shopping items to Evernote, automatically email your to-do list to your spouse, add your Echo to-do list to your iPhone, and more. Re-order Prime-eligible products: If you’re low on kitchen supplies, want to restock on snacks, or need more rolls of duct tape for the garage, simply ask Echo to place an order for you. Echo uses your order history and can order the Prime-eligible item for you using your default payment and shipping settings. If Echo can’t find the requested item in your order history, it may suggest an item for your approval using Amazon’s Choice, which picks highly-rated, well-priced, Prime-eligible products. Sports scores and schedules: Alexa will tell you the results of your favorite team’s last game, the current score of a game they are playing, and the time and date of the next game. To give it a try, simply say, “Alexa, what’s the score of the Mariners game?” or “Alexa, when do the Seattle Sounders play next?” Alexa knows scores and schedules for the NBA, NHL, NFL, MLB, MLS, and NCAA basketball, with others coming soon. Traffic: Just save your work address and Alexa will tell you the quickest route and travel time to work each morning so you know exactly what to expect before leaving the house. You can also add a stop to your commute in case you need to drop off a child at school or stop by a coffee shop on your way to work—just add the stop to your settings, and Alexa will give you the route and travel time. Prime Stations: Prime members can ask Echo to play hundreds of ad-free, personalized streaming music stations via Prime Music. Like, dislike, or skip as many songs as you wish while you discover songs from the Prime Music catalog. Customized news: You can now hear from more sources in your news Flash Briefing including The Economist, NPR Business, TMZ, and ESPN Radio via TuneIn. In addition, developers have been using a private beta of a free SDK to build new capabilities and skills for Alexa, which will start rolling out later this year. 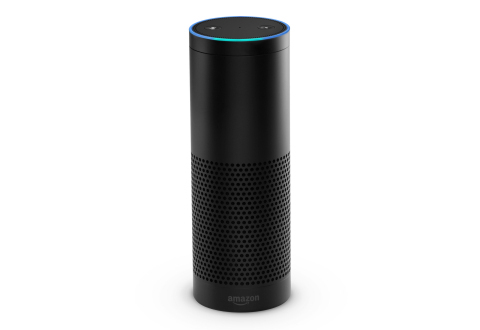 Amazon Echo is $179.99 and is available for customers in the US to pre-order today at www.amazon.com/echo. It will start shipping July 14.